Hugo Chávez and the Middle East: Whose side was he on? 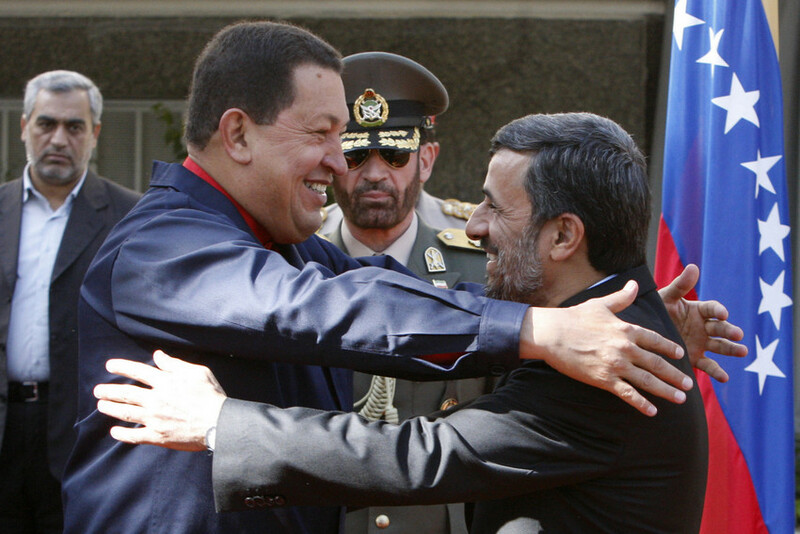 Hugo Chávez and Mahmoud Ahmadinejad embrace. The death of Hugo Chávez is a turning point and an opportunity -- regardless of who wins the first post-Chávez election April 14 -- for Venezuela. The image and concept of Chávez himself, practically beatified by some some, reviled by others, is part of this next stage. Chávez was a confounding man: committed to a particularly immediate and hands-on brand of social justice, he reduced poverty by 50 percent in Venezuela and helped Latin American unite, addressing hemispheric problems away from the long shadow of the U.S. But Chávez was also a bully, appropriating domestic media, terrifying investors. And when it came to foreign policy, he often embraced some of the world&apos;s most dangerous despots. My longtime friend Danny Postel, the associate director of the Center for Middle East Studies at the University of Denver’s Josef Korbel School of International Studies and the author of Reading “Legitimation Crisis” in Tehran (2006) and the coeditor, with Nader Hashemi, of The People Reloaded: The Green Movement and the Struggle for Iran’s Future (2011), wrote this fascnating piece about Chávez&apos;s relationship to the Middle East for the University of Chicago&apos;s Critical Inquiry. He agreed to let me share it here. Most of the postmortem commentary on Hugo Chávez has focused on his domestic legacy in Venezuela, his wider regional legacy within Latin America, and what we might call his hemispheric legacy—his “special relationship” with the United States. And for good reason: these were the principal realms in which he operated during his fourteen years as Venezuela’s president (1999–2013), and it is for his accomplishments in these domains that he will be remembered and the Chávez Era (it was, to be sure, an era) will be evaluated. But there’s a less discussed dimension of the Chávez legacy that I’d like to examine briefly: his relations with the countries of the Middle East and North Africa, a story whose significance became more salient with the onset of the momentous changes the region has been undergoing over the last few years—not merely since the “Arab Spring” or Arab revolts starting at the end of 2010 but going back to the upheaval in Iran in the summer of 2009. But, first, let me be clear that I admire a great deal of what Chávez and his Bolivarian Revolution accomplished in Venezuela. As Mark Weisbrot of the Center for Economic and Policy Research points out, the Chávez government reduced poverty by half and extreme poverty by 70 percent. Millions of people also got access to health care for the first time, and access to education also increased sharply, with college enrollment doubling and free tuition for many. Eligibility for public pensions tripled. And it’s significant that Chávez did all of this through the ballot, not the bullet. He was elected and reelected repeatedly, and by wide margins. I’ve praised the experiments with alternatives to neoliberalism in Venezuela, suggesting that other movements around the world study and learn from them. I’ve even beentaken to task for being too pro-Chávez. It’s precisely because of these positive accomplishments that Chávez’s record on the Middle East and North Africa is so disconcerting. The Bolivarian Government of Venezuela expresses its firm opposition to the vicious and unfounded campaign to discredit the institutions of the Islamic Republic of Iran, unleashed from outside, designed to roil the political climate of our brother country. From Venezuela, we denounce these acts of interference in the internal affairs of the Islamic Republic of Iran, while demanding an immediate halt to the maneuvers to threaten and destabilize the Islamic Revolution. This provoked widespread dismay and appeals to Chávez from Iranians, many of whom sympathized with the ideals of the Bolivarian Revolution, to stop supporting their reactionary president. Those appeals, alas, went ignored, further damaging the standing of the Venezuelan leader among progressive Iranians. “In Egypt, the situation is complicated,” Chávez pronounced during the Tahrir Square protests that brought down Egyptian dictator Hosni Mubarak. He remained conspicuously silent on the Battle of Cairo, one of the great democratic uprisings of recent times, remarking merely that “national sovereignty” should be respected. These international alliances raise troubling questions about Chávez’s judgment and legacy (a legacy that awaits, and deserves, a thorough historical reckoning along the lines of Perry Anderson’s magisterial retrospective on Brazil’s Lula), especially for those of us who do admire many of the Bolivarian Revolution’s accomplishments. Some of Chávez’s defenders chalk these unsavory alliances up to realpolitikcalculations that a Third World leader has no choice but to make in dealing with a global hegemon hell bent on undermining all alternatives to its dictates. But this only goes so far. Lula’s foreign policy involved lots of deals and alliances—the Brazilian-Turkish attempt to resolve the Iranian nuclear issue, for instance—but, unlike Chávez, he never defended the repressive domestic policies of the Islamic Republic or denounced Iran’s democratic movement. Dealing with ambiguity has never been a particular forte of the Left. Yet assessing the legacy of Hugo Chávez requires nothing so much as a sense of ambiguity. I thus find Bhaskar Sunkara’s observation that the Bolivarian Revolution contains “both authoritarian and democratic, demagogic and participatory” elements most refreshing. I know from personal conversations with countless progressives that ambivalence about Chávez, particularly on the international front, runs deep—but the critical conversation has yet to reflect that ambivalence. Theorizing Chávez’s international relations—examining the ideological affinities between his left-wing populism and the right-wing populism of Ahmadinejad, exploring patterns between his domestic and foreign policies, comparing his international dealings with those of other progressive leaders in the Global South—remains to be done. I don’t think any complete reckoning with the legacy of this historic political figure can be complete without confronting these questions, thorny though they may be. Rather than draw any grand conclusions on this phenomenon, though, I’d love to hear what thoughtful admirers of Chávez like Ernesto Laclau might have to say on the subject. Perhaps we can enter into a critical dialogue on this theme.